This is like my favorite day of the month!! I love One Dae Fae day!!! Its one day a month that Amanda from Faery Ink creates this super adorable freebie for us all that's only available for 24hrs in the shop!! It is always a super cute little image!! And this month is not exception!! Look at this sweetie!!! I just giggled the entire time I colored her!! For real!!! 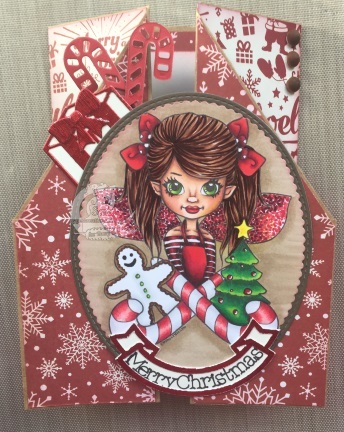 And when I was done I used this awesome tutorial to turn her into a Double Gate Fold Christmas card!! I love her so much you are gonna get to see her a few times this post!! For cardstock I used CTMH Kraft and colonial white. The papers are from My Minds Eye- Comfort and Joy collection. And then just for some added shine there is a red metallic paper used as an accent. I used some new dies for the candy canes and present. 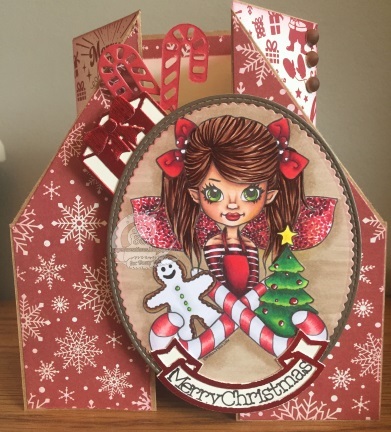 I wrote and cut the sentiment with my Cricut Explore using the CMTH Artistry cartridge. 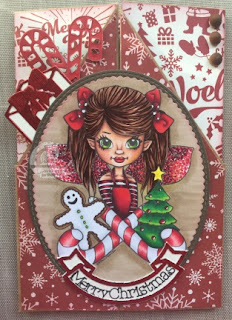 Oh and a little Tim Holtz candy apple distress ink on all the edges. And that's my adorable Arielle Candy Cane Christmas Elf for you!! Make sure you pop by the store to grab yours today!!! I also want to take a minute to Thank all of you, Amanda, and the Faery Ink DT for having me the last 10 months!! Its been such a blast!!! Amanda is in the process of choosing a new DT right now!! I do hope to stay on the DT but who knows.. maybe One of you will get my spot!! I have had so much fun and loved creating along with you all and with Amandas incredible images!!! Best of Luck to all those trying out for new DT and congrats to those who make it! !